It’s so hard to believe that it’s 2014 tomorrow! I still think the turn of the century is a new thing. On the other hand, it also seems like we’ve been living on the road and writing about Technology for Travelers FOREVER! We sold our house and started living in a motorhome in fall of 2003. We’ve been thru several websites since then. It is so easy for content on the Internet to disappear into the ether. I have made a point to keep all our articles, but they are scattered over several places. Before we came up with the name Geeks on Tour, we called the website WiFiSavvy. I’ve archived that website on WordPress.com. You can read the very first article from February 2004, What is Wi-Fi? there. Then came www.geeksontour.COM with several years of articles. Our current main website is www.GeeksOnTour.com. We’ve done some restructuring now, and, after the first of the year, the newsletter articles will be back on GeeksOnTour.com. In this article, I am listing the location of all the archived articles and newsletters. In the early days, the newsletters contained the complete articles, now the articles are separate and the newsletters refer to them. I’m probably the only one who cares about technology articles we wrote 10 years ago! So, this listing of links is for my reference. It’s my list of where I put stuff. In case you missed any of them, you can see just the most recent articles by clicking this link to GeeksOnTour.com articles and they are in order with the most recent first. Picasa Tips July 2007 to 2013: This is a separate website devoted to tips about managing your digital photos with Picasa. It was first called PicasaTutorials.com, now it is called PicasaGeeks.com. Our official Geeks on Tour emailed newsletters have always been delivered using the AWeber.com service, so they have an uninterrupted archive. Articles on the RV.net Blog. 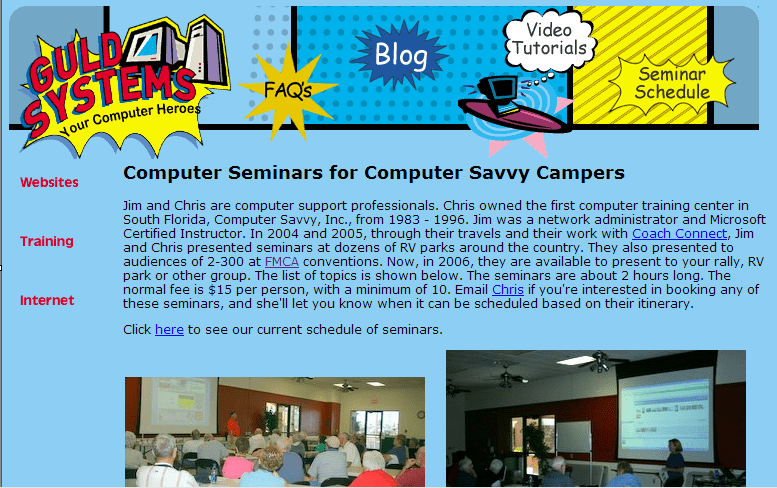 RV.net is a blog and social network for RVers hosted by the Good Sam Club and Camping World. Chris Guld of Geeks on Tour is a contributing author for topics about Technology for Travelers. We’ve chronicled our life and travels consistently on the Blogger.com platform since we started thinking about a life on the road … April of 2003! Published by MrsGeek, in Blog. Tagged with Geeks on Tour Articles, Technology for Travelers. You GEEKS are terrific. Happy New Year. How do I get to talk to you/or staff member. I have some “how to” questions which I can not find answers to. Are there associates of yours that assist on line (for a fee). I am 73 years old and my learning curve is flat.